The Iraqi city was under ISIS control for three years. 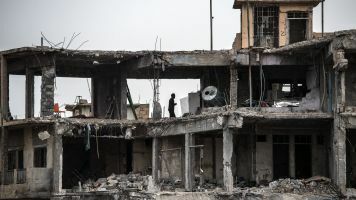 The next battle in Mosul will likely be rebuilding and making the city safe again for civilians after it was largely destroyed from continued conflict. Iraq's prime minister said that the city — which was held by ISIS for three years — has been fully freed. Those on the ground said violence hasn't completely stopped. And some civilians who were stuck amid the fighting are now being rescued. The United Nations says over 900,000 Iraqi civilians have been displaced from Mosul since last October. Now, some are coming back and looking to restore their homes. "This house means my whole life to me. It is my small nation. It was painful to see it destroyed," Iraqi resident Ahmad Belo Malla El Hadidi said. But it's not just homes. Schools, hospitals and other basic amenities — like water and electricity — have been obliterated. The U.N. estimates minimum restoration will cost at least $1 billion. Another barrier to getting the city up and running again is potential explosive devices left in buildings. Iraqi forces are working to check and clear those. But some residents still seem encouraged by what's to come. "All the people of Mosul and Iraq must heal their wounds, and look ahead to a new chapter," El Hadidi said.